Braided horse hair tied into a rope halter with fiador knot and lead rope. Setting the knots was the tough part. So it really wasn’t a mummy. The white horse was a model for my latest venture into custom pieces I never dreamed of: a replica rope halter made from horse hair. Really, folks, I’m as impressed with rope halter as I am with the horse head. But this tale has a sad beginning. The rope halter is made from the tail of a horse named Matador. He died recently of colic. He was a beauty. I’d be lying if I didn’t say I shed a few tears when I got his tail in the mail. A small reminder of my loss of Saint in April (horse…dog, it’s a loss no matter how small or tall the friend). A fiador is a round knot under the chin, which makes a loop where the trainer can clip on the lead rope. Learning how to tie a rope halter with fiador was the first task. Not as hard as I suspected. Next, I had to shrink all the measurements to make it a smaller size. Again, not as hard as I suspected. Then it was making the rope from Matador’s tail: all 7 feet of rope. Matador had an impressively long tail, but I still had to make 16 pulls to weave them all into a 4 strand braid. Seven feet of braided horse hair. 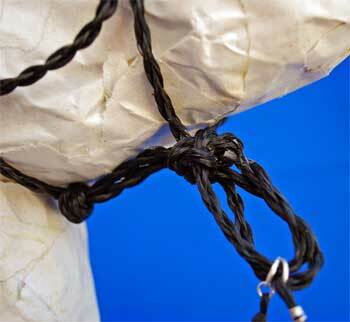 Now came the hard part: tying the rope halter with the horse hair. Horse hair is flexible, but stiff. It will take the shape of anything, but sometimes it has to be forced into that position and held there for quite a while. All of the knots wanted to come undone when I tied them, so I had to set them by weighting the halter. With the fiador tied, I hung it from a lamp with a horse bit (how appropriate) and a candle in a cup that looks like a cappuccino (thank you Secret Santa ’07) . No rhyme or reason here, just heavy stuff that was available. A few days of hanging set the fiador knot and I tied the rest of the halter. While that was hanging to set the knots, I moved onto the horse head. If you look closely, you can see the horse's eye. 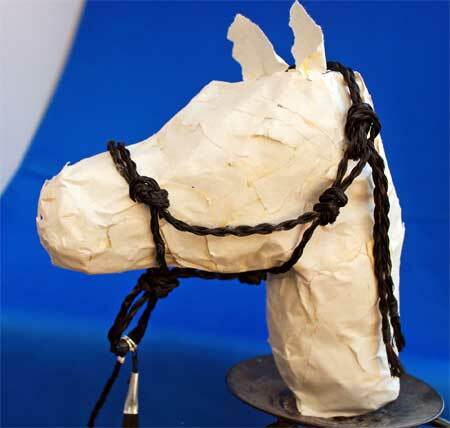 The rope halter looked like a jumble of knots without something to give it shape, so I conceived making the horse head out of what was, again, handy…newsprint, freezer tape and glue. 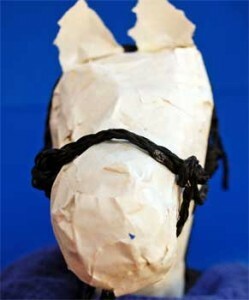 The muse of the horse head guided my hand through a box of glue to Elmer’s wood glue. It gave the paper a hard exterior almost like paper mache. Elmer’s regular glue made it a bit soggy. 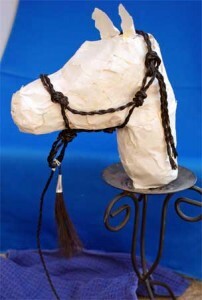 So now the horse head and halter are headed across the country to California. In a few days a man will be opening a box and remembering his faithful companion. 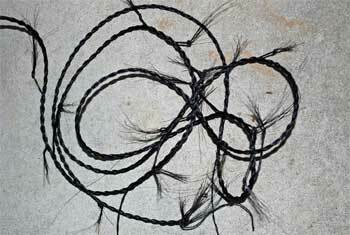 This entry was posted in Horse Hair, Nature and tagged halter, horse hair by Susan. Bookmark the permalink. Very nice work, Susan! And you’re s good teacher! Thanks for your help on Sunday. I’ve been putting your lesson to good use. Sue – that’s amazing! Great job! It’s beautiful – thank you so much for turning my idea into reality!